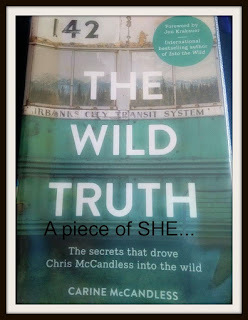 To be honest, I picked up The Wild Truth By Carine McCandless , thinking it is "Into the Wild" by Jon Krakauer. I was in hurry; I just noticed the name at the top right “Jon Krakauer” and grabbed it. I realized my mistake only after coming back home. So , it was like reading the second part of the book first.I haven't read or seen "Into the Wild" yet. But I think I have idea of whats it about. still forgive me for any mistake, if any. I really like the cover of "the wild truth". Its not misleading and if you read the book (or already read or seen into the wild) you understand the importance and meaning of the picture in the cover. The image of the "magic bus" 142, with the reflection of beautiful mountains of Alaska on its window is very thoughtful, emotional and creative. Reading, The Wild Truth was extremely painful for me. I felt emotionally exhausted, at times. Although my opinion might vary from that of author Carine , but I think I do understand her loss and pain. Could it be possible that death of Chris McCandless and their dark family secrets are not related? Is it possible that he left for Alaska because he loved nature? That he was just looking for adventure? That he was just trying to discover his true self by being alone for sometime in the midst of the nature? From the book, we know that he tried to come back but couldn’t. He just didn’t know how difficult this particular path could be and died accidentally? No doubt, he had a difficult childhood but I think he was someone who knew that from where you come is not important but what you become. And we all know from his journals and his life that he turned out human, a good human. In a letter, written to his sister, Claire, Chris Has said, “I am divorcing them (his parents)”. He was a brilliant student with a degree and promising future. If he really wanted to die, he would not have completed his education. He could’ve died easily, using other ways. He didn’t need to go to Alaska for that. May be Alaska was his love, his passion and his dream. His simple soul was aching for a life far away from the material complexities of the world. Like Chris wrote in his journal (in caps), “ HAPPINESS ONLY REAL WHEN SHARED” and maybe he wanted to share his with the nature. I might be wrong but I don’t think he deliberately set off for Alaska to die because of his dark family secrets. I think he had left his past behind the day he started his journey under his new name "Alex". Nevertheless, this book has brought up an important issue in front of us. Domestic violence and role of parents and its effect on their children. Chris and his sister Carine give us hope that all those who grow up in the difficult family doesn’t always turn into drug addicts. Some become Chris and Carine – a good soul and good parent. Not having read the book before I saw the movie, I was saddened by the end. What a tragic and perhaps even senseless conclusion to a spirited young man's courageous quest for personal freedom.